The invention of the combustion engine was a significant technology innovation. But its transformative capacity was unleashed only by process innovation – the power of the assembly line. Together, technology plus process combined to revolutionize the transportation industry. Similarly, the availability of immense amounts of data from sensors throughout the manufacturing factory environment is a major technological phenomenon. But without process innovation, that data is just so many bits and bytes. 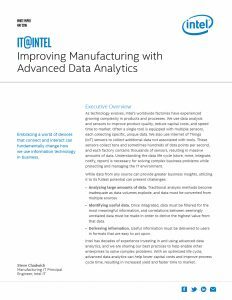 As documented in our recent white paper, “Improving Manufacturing with Advanced Data Analytics,” we’re metamorphosing that data into wisdom – and generating considerable business value – by creating processes that support real-time decision making. 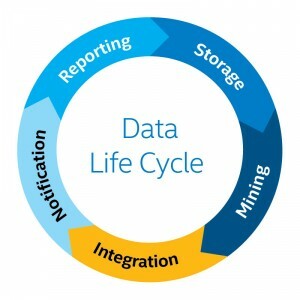 In my role as Manufacturing IT Principal Engineer for Intel IT, I have found that a crucial component of those new processes is the data life cycle. Thoroughly understanding the data life cycle and managing it more efficiently allows Intel IT to protect information, solve complex problems, and manage the IT factory environment effectively. Data storage. We use storage methods that can handle tens to hundreds of data points per second, terabytes of summary data, rapid read/write capabilities, and archiving. We’ve carefully designed our storage system with an eye toward future data growth. Data integration. To solve complex problems and create meaningful insights, we perform data integration across disparate sources. This integration provides multiple, distinct viewpoints that, when combined, reveal a holistic view. Notification. To make notifications as effective as possible, we prioritize them, deliver them to appropriate devices, highlight what is most important, and when appropriate, prompt a response. Reporting. We deliver actionable information tailored to the device and user receiving it, using HTML5-based content that is clickable and easily consumable. 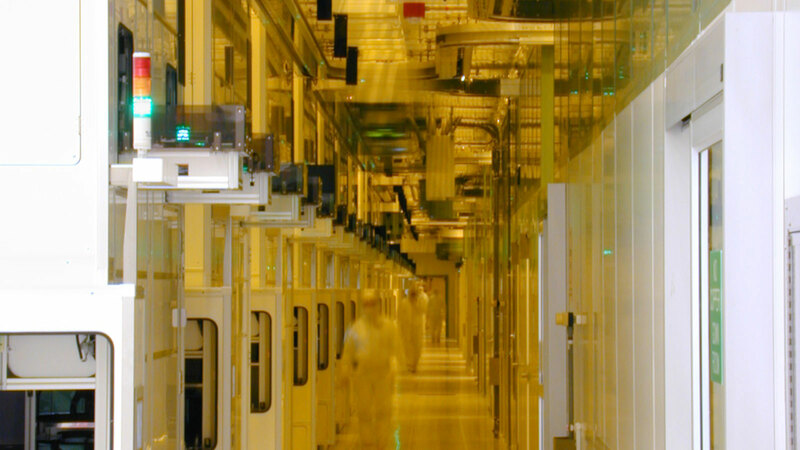 Engineers at Intel’s factories are responsible for tool health. Using sensor data and investigatory interaction in the factory environment, these engineers can now run analyses that determine what sorts of tool health data is meaningful, what decisions need to be made in which timeframes, and under what conditions should notifications be sent. Many of our factory environment sensors on equipment collect hundreds of data points per second. We extract this data and use it for both real-time detection and end-of-line correlation. Engineers and manufacturing technicians use the meaningful results to refine equipment behavior. How will the data be consumed? How is the data stored (schema)? Where does the data reside? How fast can it be retrieved (affects hardware choices)? We have hundreds of sensors collecting massive amounts of data points every day; the resulting data sets are huge. Over time, we have allocated resources and tools to help us manage and harvest the value from this data. For those getting started, realize that the potential of data doesn’t require a vast network of sensors in the beginning; it starts with understanding how to manage and optimize whatever sensor data is available. Intel IT started small and experienced a learning curve in mining and integrating data across multiple sources. We then were able to identify what was most important in the vast sea of information and we soon discovered actionable insights. Our algorithm development started with a single variable, then we slowly added complexity. Now, our analytics activities have grown to support increasing amounts data, in addition to more traditional sources. I’m confident that as others undertake this journey, they will also realize the benefits they can obtain from their own data. 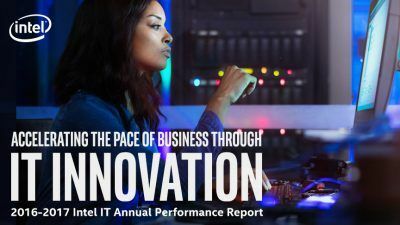 Read our paper for additional information, or our recently published 2016-2017 Intel IT Annual Performance Report, “Accelerating the Pace of Business through IT Innovation,” and then begin to put your data to work. You will be amazed at the results! Steve Chadwick is a Senior Principal Engineer in Manufacturing IT. Steve joined Intel in 1996 and has spent much of his career in process engineering before transitioning into IT. Steve's current focus is on improving TMG engineering systems working to development and implement systems to improve manufacturing capability. He holds a Doctorate in Computer Science and a M.S. in Chemical Engineering. Interests include data visualization, process control, data analysis, as well as lean methodologies as applied to the manufacturing process.